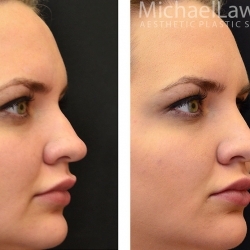 Aesthetic surgery of the nose, or rhinoplasty, is quite different from other facial aesthetic surgery, as in most cases the goal is not to correct aging changes, but rather to improve the contour or shape of the nose that has always been present. 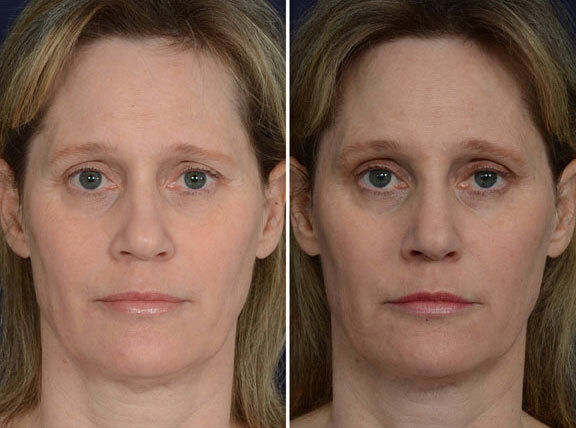 More than any other facial feature, subtle alteration of nasal shape and apparent size can have a truly remarkable impact on overall facial harmony and balance. 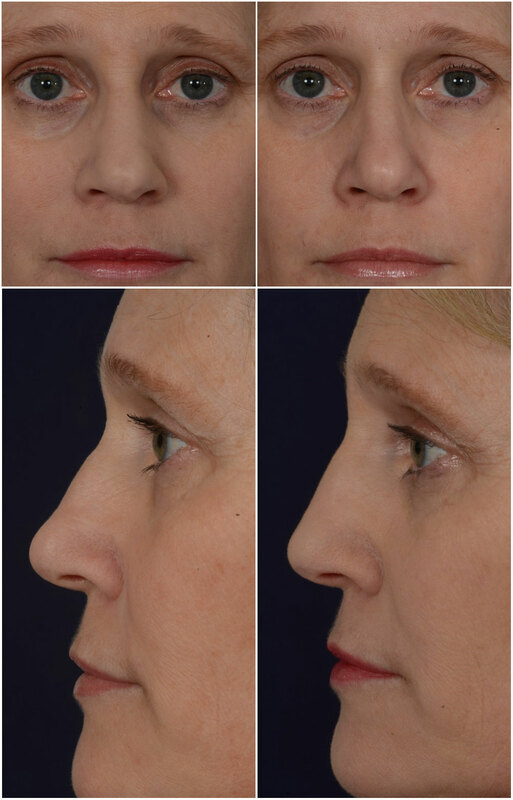 Quite obviously, noses come in an endless variety of shapes and sizes, as do patients’ expectations for nasal refinements. 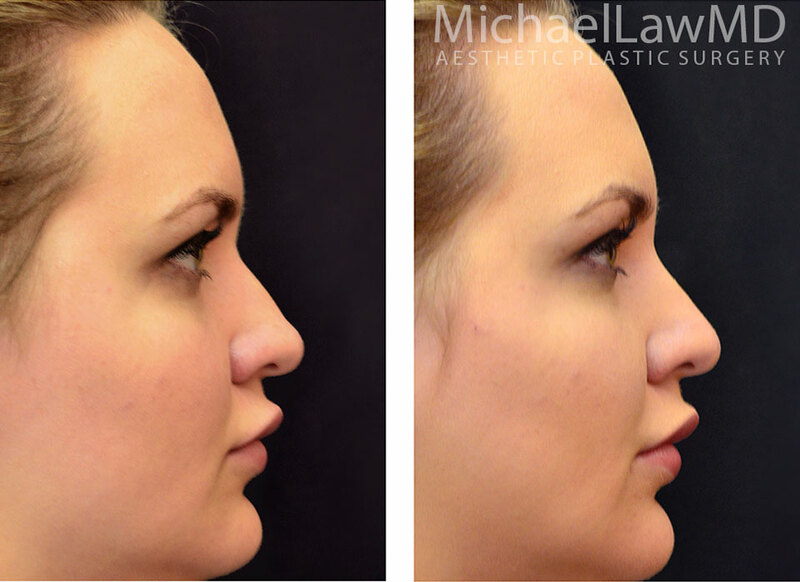 These factors make rhinoplasty an extremely challenging, and extremely rewarding, surgical endeavor. Prior to performing rhinoplasty surgery I carefully evaluate preoperative pictures with every patient, on at least two occasions. We determine together the postoperative goals, with a realistic appraisal of the improvements which are possible. It is absolutely essential to ensure that the proposed changes will ultimately ‘fit the face’. 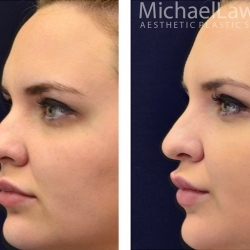 It is also important to recognize that the nose, as much or more than any other facial feature, provides individuality and character to one’s appearance. 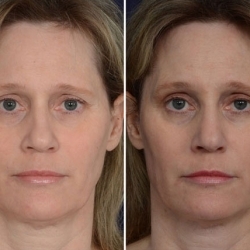 Surgical changes of the nose, and thus of the overall facial appearance, must be very carefully considered. In most cases such changes do not need to be ‘drastic’. 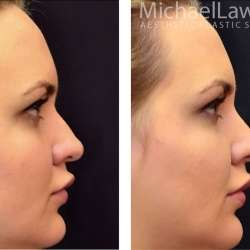 An overly aggressive rhinoplasty is probably the facial aesthetic surgery procedure that is most likely to be immediately recognized as unnatural or ‘done’. 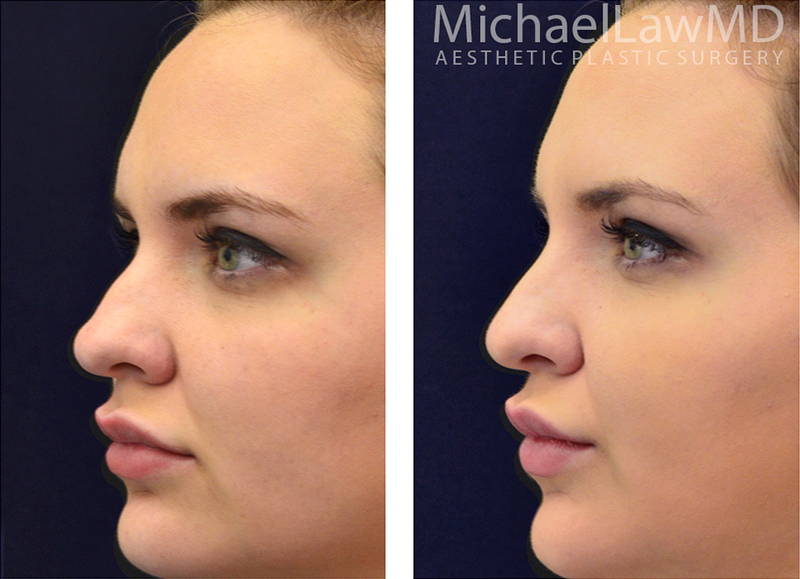 Rhinoplasty may be performed alone, or in concert with other facial rejuvenation procedures. 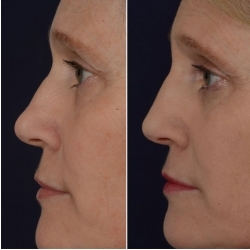 One important consideration in assessing the appearance of the nose in profile is whether or not the anterior projection of the chin is in harmony with the anterior projection of the nose. An inadequately projecting or ‘weak’ chin may contribute to the appearance of an overly large nose. 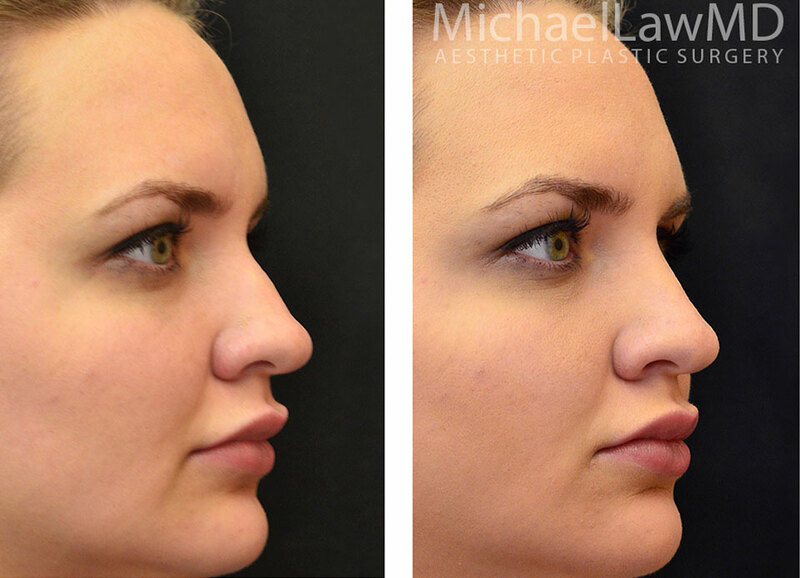 In some patients undergoing rhinoplasty, I also perform chin enhancement using a soft, anatomic implant placed over the most anterior aspect of the mandible through an incision below the chin. 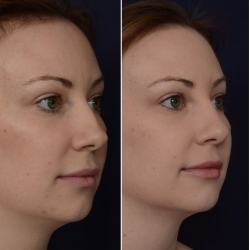 On occasion I perform a chin implant alone (instead of rhinoplasty), as in some patients the enhancement of the anterior chin projection in profile may be adequate to ‘reduce’ the apparent nasal projection. 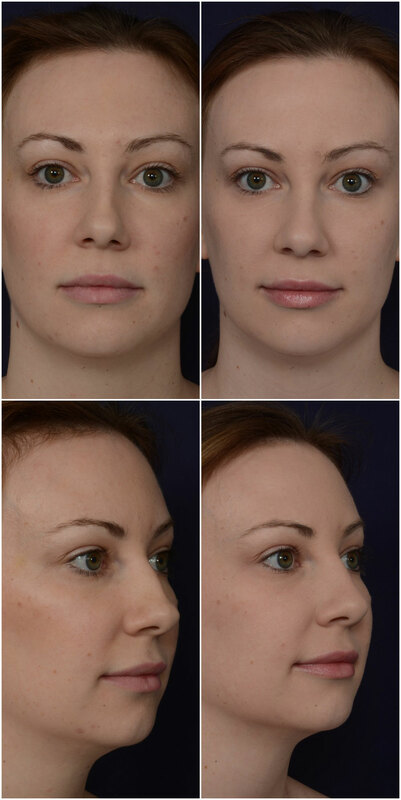 Other procedures that are frequently performed to complement and enhance the results of rhinoplasty include liposuction of the area below the jawline and the anterior neck (this also makes the chin and mandible appear ‘stronger’ and more sculpted), and fat grafting to enhance the lips, cheeks and perioral area. 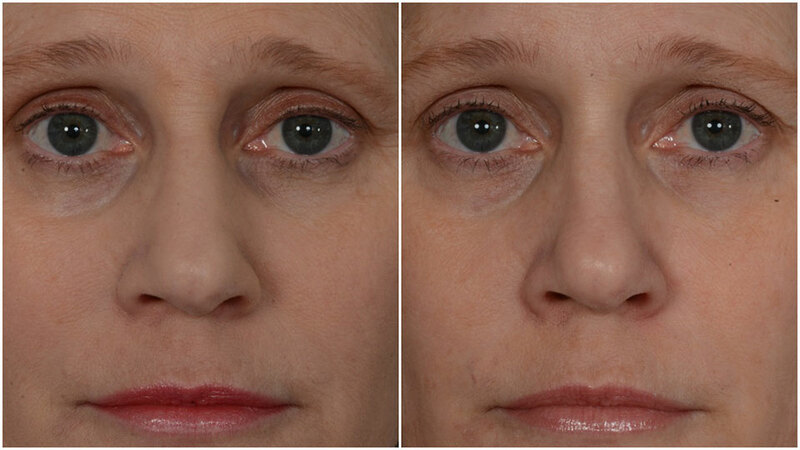 Because rhinoplasty nose surgery often results in some temporary bruising around the eyes, it is also not unusual for patients to elect to have eyelid surgery performed at the same time, since there will be a week or two of eye area ‘downtime’ after the nasal cosmetic procedure. Perhaps as many as a third of rhinoplasty patients I evaluate have some evidence of nasal airway obstruction which makes nasal breathing more difficult. 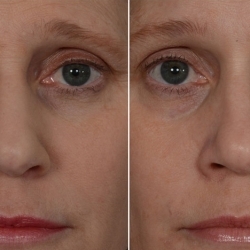 In most cases, the cause can be identified preoperatively and treated at the time of surgery. Common causes include deviation of the nasal septum and overgrowth of the nasal turbinates, structures inside the nasal cavity which assist in warming and humidifying air on its way to the lungs.